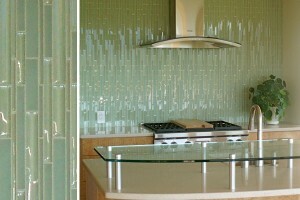 Thinking of remodeling your kitchen? As the center of the home, the kitchen is one of the places we spend most of our time. It’s not just a place to cook, but also to entertain, to work, and of course to eat. Why spend so much time in a drab kitchen when a makeover can add so much value to your life and home. Upgrading a kitchen is full of possibilities to refresh and modernize your space. Simple projects like updating décor, improving your layout and adding more storage can dramatically change your kitchen for the better. No one said kitchen remodeling was easy so here are some tips to think about before starting! Storage is key to a well organized and functioning kitchen so make sure your cabinets are at least 12” wide, otherwise they will be useless. Items should be close to where you use them. Dishes should be stored a step away from the dishwasher and pans near the stove. The more steps you have to take to get an item, the less efficient your kitchen runs. Think about this carefully as you are laying out cabinets and drawers if these new materials are part of your plan. Countertops that are littered with a clutter of appliances such as coffee makers, toasters, and blenders make the room look messy. Some people even have duplicate appliances and then it becomes a battle between the magic bullet vs nutribullet for counter space, things can get pretty competitive. These items most often end up in the way when you are trying to actually cook. Also, why spend money adding a beautiful countertop when you’ll just cover them up?! Put all those things away in your improved storage and let your counters show off their true beauty. No one wants to be left alone to cook. 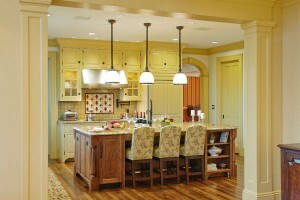 Think about how you can open up your kitchen to the rest of the house, which allows the cook to be part of the party. It allows you to utilize your countertops as buffets or keep up with the Super Bowl while preparing the dips! Make sure paths running through your space are at least 36” wide and cooking areas are at least 42” wide for one chef, 48” wide for two. Avoid placing a cooktop in a heavily traveled pathway, especially with children. Give yourself a landing space of 15” on either side of the cooktop and fridge. All these things will allow your kitchen to function in ease. Since the kitchen is most often the center of home life, you may as well bring your style into the finishes and furniture. 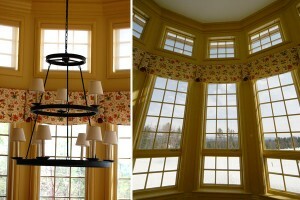 Think about the other colors and styles that are prominent in your home and apply them to the kitchen as well! Adding molding, a custom backsplash, interesting light fixtures and perhaps a window treatment are all ways to show off your style.